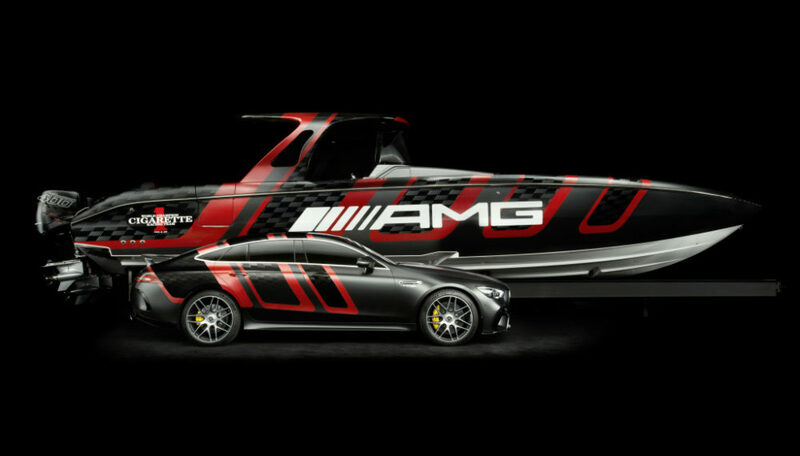 The third entire vehicle to be developed by Mercedes-AMG directly. 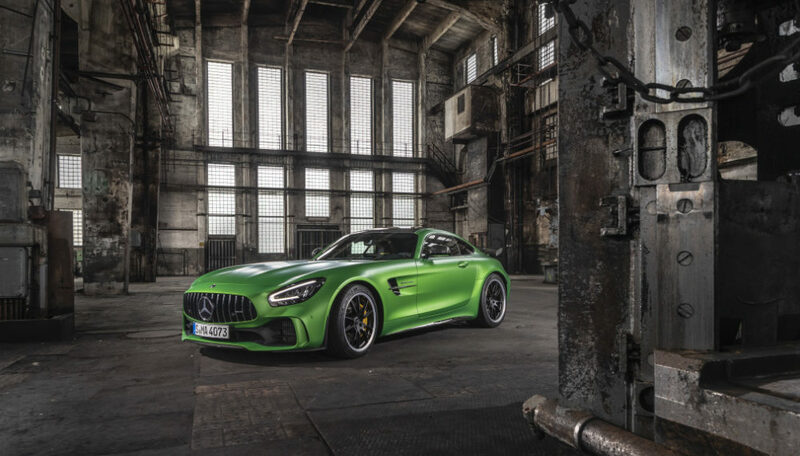 It combines the impressive race-track dynamism of the two-door AMG GT sports car with the greatest possible everyday usability, offering space for up to five people. 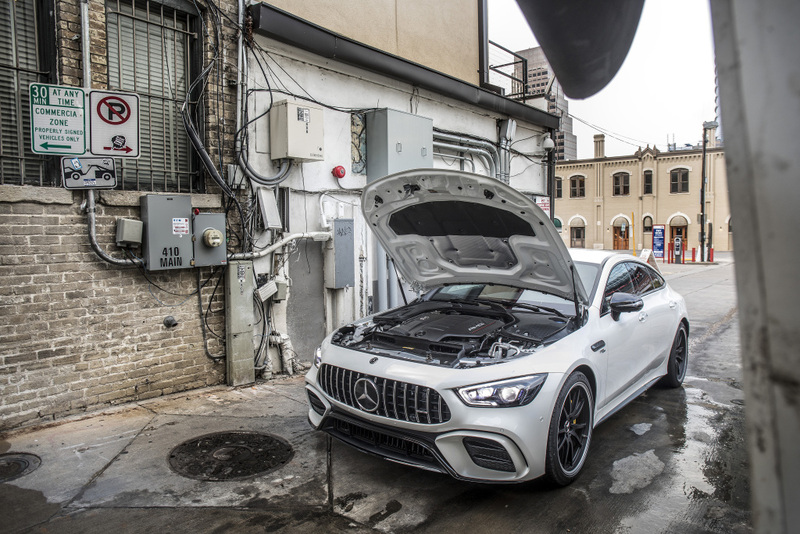 Engines: 4.0-litre V8 biturbo in two output stages with 430 kW (585 hp) and 470 kW (639 hp) respectively | 800 Nm and 900 Nm maximum torque respectively. Compact design, spontaneous response, tractive power right from the low rev range as a result of inside turbochargers (“hot inside V”). Assembled and mounted in the hand-finishing section in Affalterbach according to the “One Man – One Engine” principle. 3.0-litre 6-cylinder inline engine with turbocharger and electric auxiliary compressor, available in two output stages with either 270 kW (367 hp) or 320 kW (435 hp) | 500 Nm or 520 Nm; EQ Boost starter-alternator delivering an additional 16 kW (22 hp) | 250 Nm. 48-volt on-board electrical system and the hybrid functions boost, recuperation, load-point shifting, gliding and engine restarting in conjunction with the ECO start/stop function. Transmission: AMG SPEEDSHIFT MCT 9G (V8 engine) or AMG SPEEDSHIFT TCT 9G (6-cylinder inline engine). Drive system: Front-mounted engine, fully-variable AMG Performance 4MATIC+ all-wheel drive. Data (V8 and 6-cylinder inline engines): Fuel consumption, combined 11.3 – 9.4 l/100 km, CO2 emissions, combined 257 – 215 g/km, 0 – 100 km/h in 3.2 – 4.9 seconds, Vmax 270 – 315 km/h. Lightweight construction: Intelligent mix of materials with high percentages of aluminium and carbon-fibre components to ensure low weight, the highest level of structural rigidity, best-possible crash safety and quality. Analysis and simulation methods from motor racing were used for the targeted reinforcement of the body structure. The bonnet and front wings are made of aluminium. The rear wall and boot cavity are made of carbon fibre. Aerodynamics: AIRPANEL active air control system (movable vertical blinds in the front apron) and multi-stage extendible rear spoiler improve aerodynamic balance and performance. 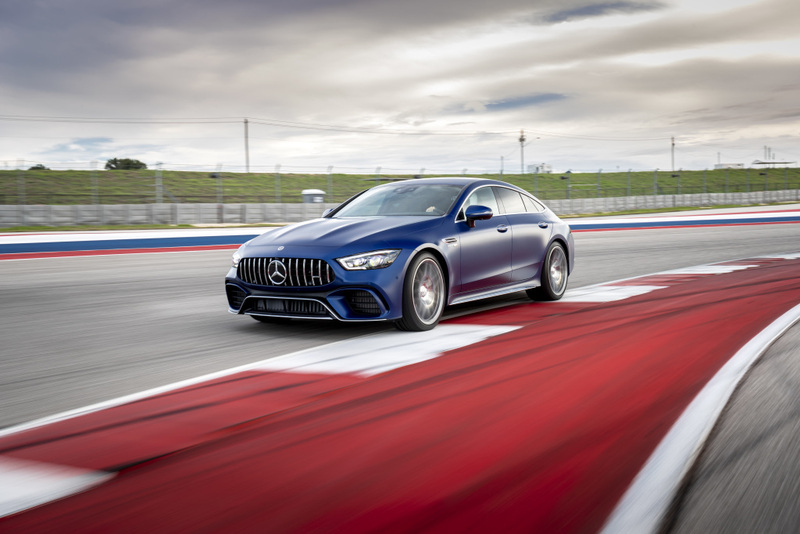 Suspension: In the case of the six-cylinder models, the AMG RIDE CONTROL suspension with steel springs and the Adaptive Damping System are used. 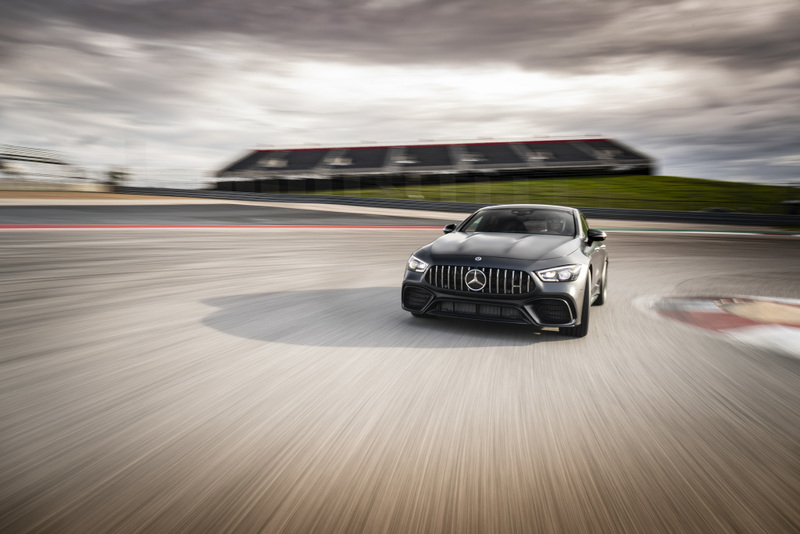 The AMG RIDE CONTROL+ suspension of the eight-cylinder variants is based on a full-support multi-chamber air suspension, also combined with the Adaptive Damping System. The complex networking of all systems and components also contributes to increasing the driving dynamics. Brakes: The high-performance composite brake system has impressively short braking paths, precise responsiveness and high structural rigidity in spite of the extreme demands placed upon it. 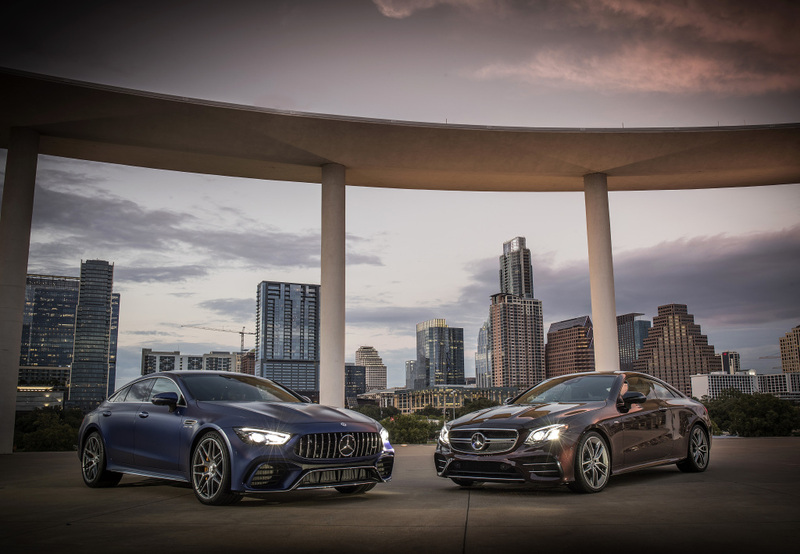 Drive programs: The AMG DYNAMIC SELECT drive programs “Slippery”, “Comfort”, “Sport”, “Sport+” and “Individual” provide drivers with a broad scope of driving dynamics. These affect, among other things, the responsiveness to the accelerator pedal, shifting of the transmission, the suspension or the steering. 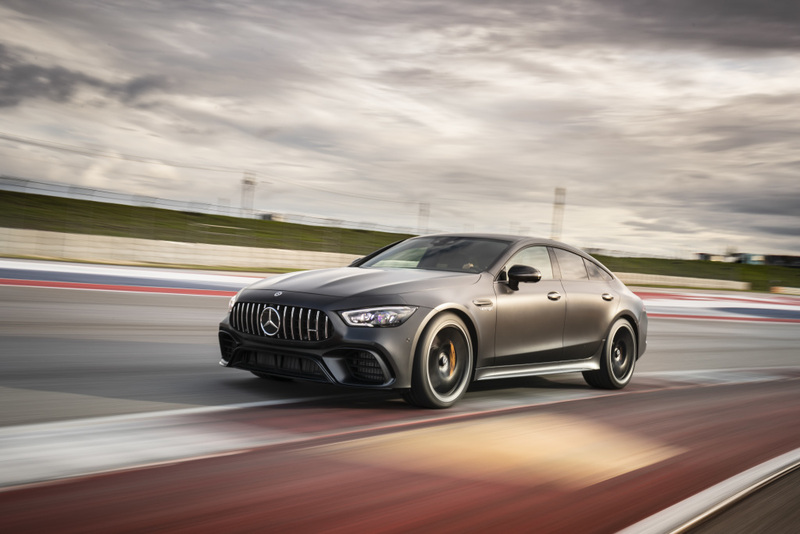 The AMG GT 63 S 4MATIC+ also offers the additional “RACE” program featuring Drift mode for optimal race-track performance (optionally also available for all other AMG GT models). 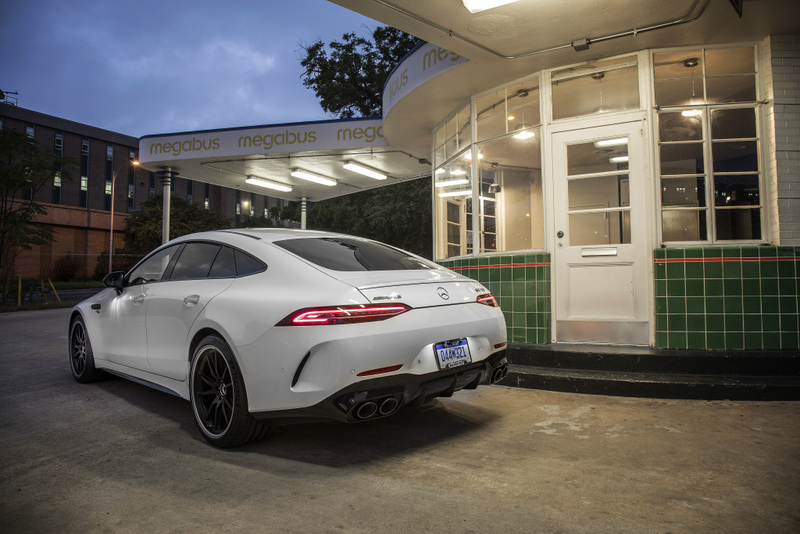 Exterior: Clearly identifiable as a member of the AMG GT family, the four-door Coupé has inherited the familiar muscular proportions which have been further developed in a truly expressive way. The face with its long bonnet and two powerdomes sends a message of dynamism and eagerness to deliver. 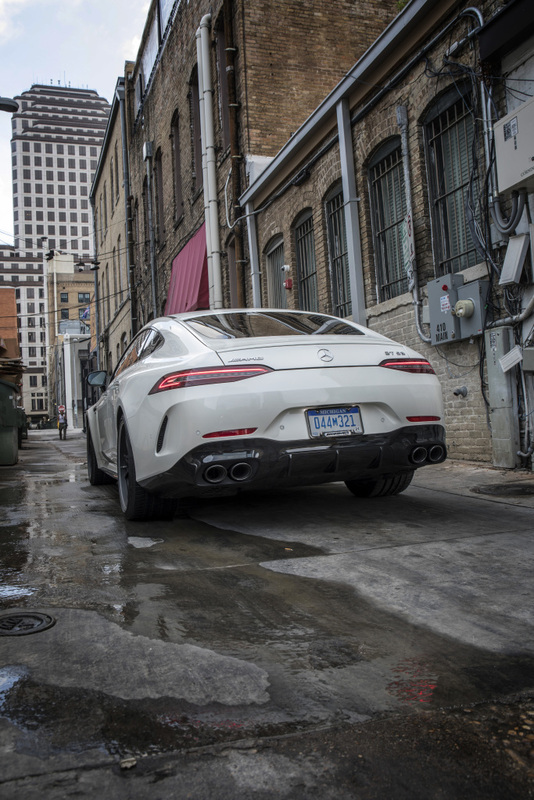 Sensuous shapes with convex surfaces lend the four-door AMG GT timeless elegance, while the flowing silhouette with the sleek greenhouse flags up its sporting credentials. 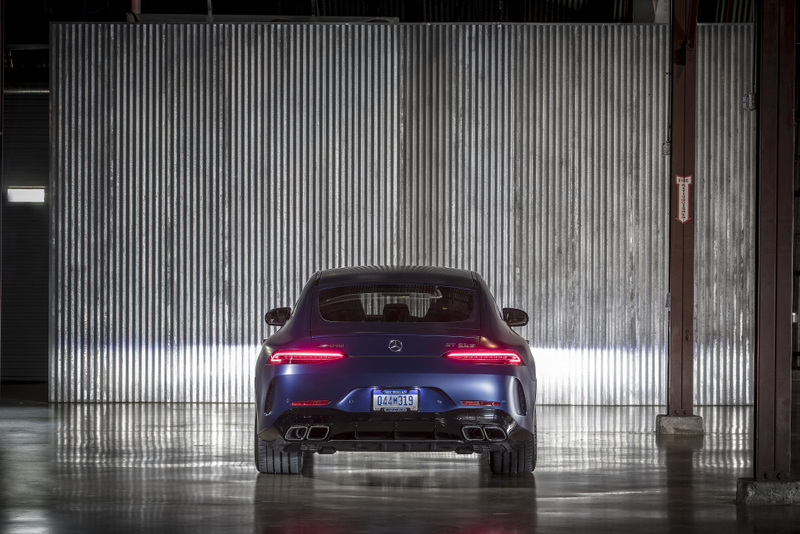 Sporty MULTIBEAM LED headlamps and filigree LED tail lamps with dynamic turn signal indicators further underline the AMG GT family connection. 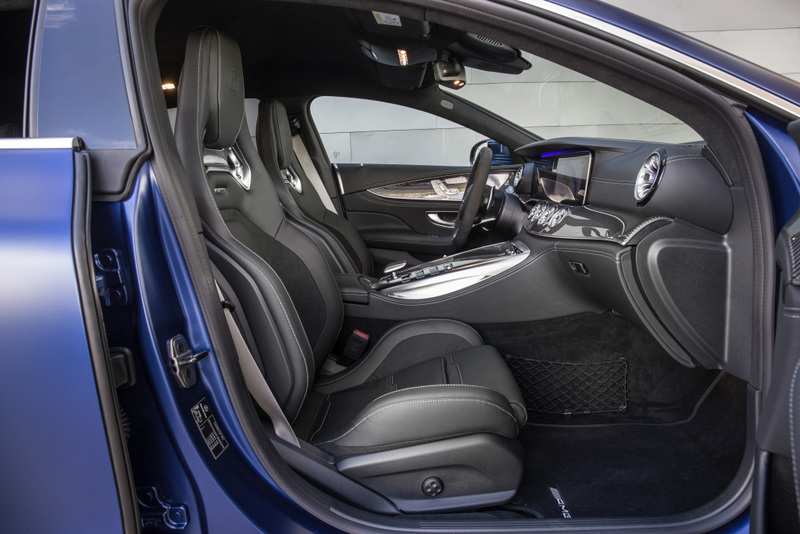 Interior: The interior of the AMG GT 4-Door Coupé stuns thanks to its sporty ambiance and generous feeling of spaciousness. It presents itself as a symbiosis of performance and exclusivity, whilst also using innovative display buttons in the centre console to set ground-breaking accents. Depending on the equipment level, either two or three passengers can sit comfortably in the rear of the four-door Coupé. Different design and equipment packages offer a wide range of scope for personalisation. Portfolio: Six-cylinder models with fully-variable all-wheel drive and active aerodynamics. Engine: 3.0-litre 6-cylinder inline engine with turbocharger and electric auxiliary compressor, available with either 270 kW (367 hp) or 320 kW (435 hp) | 500 Nm or 520 Nm; EQ Boost starter-alternator delivering an additional 16 kW (22 hp) | 250 Nm. 48-volt on-board electrical system and basis of the hybrid functions boost, recuperation, load-point shifting, gliding and engine restarting in conjunction with the ECO start/stop function. 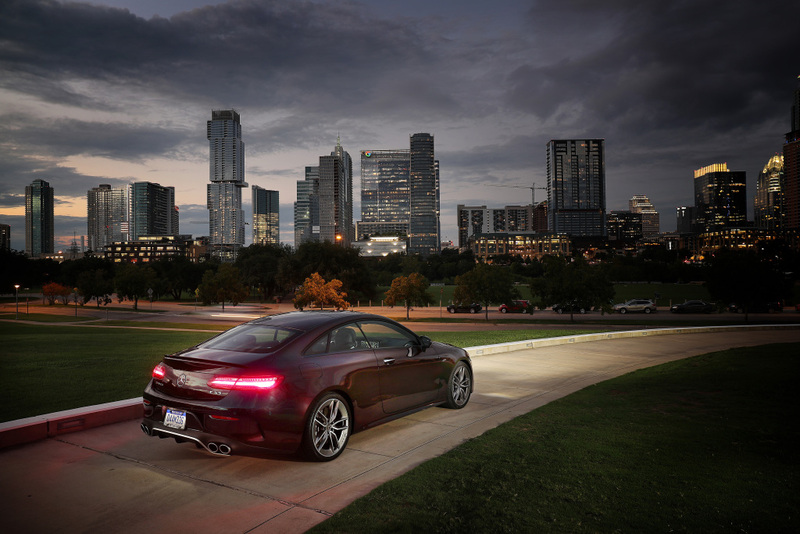 Transmission: AMG SPEEDSHIFT TCT 9G, nine-speed automatic transmission with torque converter. Data: Fuel consumption, combined 9.4 – 9.1 l/100 km, CO2 emissions, combined 215 – 209 g/km, 0 – 100 km/h in 4.5 – 4.9 seconds, Vmax 270 – 285 km/h. 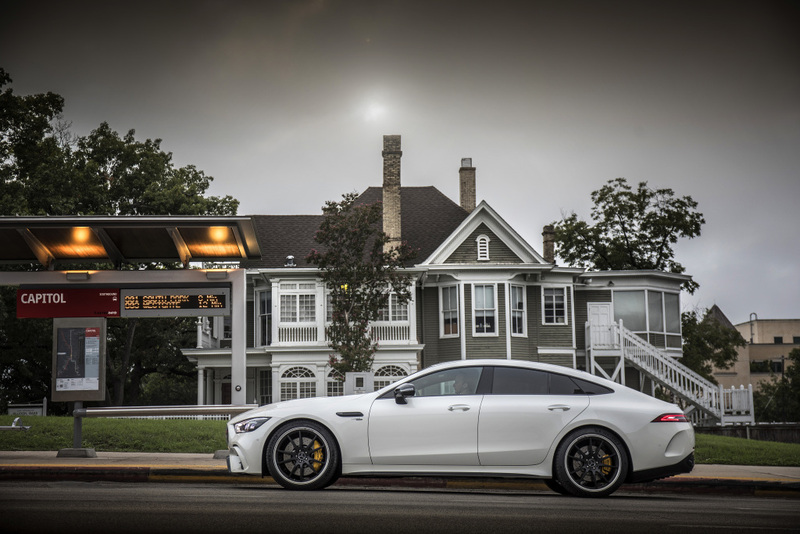 Brakes: AMG high-performance composite brake system for the best-possible deceleration with minimum weight. 360 x 36 mm composite brake discs at the front and 360 x 26 mm solid cast brake discs at the rear. 6-piston fixed calliper (grey) at the front, single-piston floating calliper (grey) at the rear. 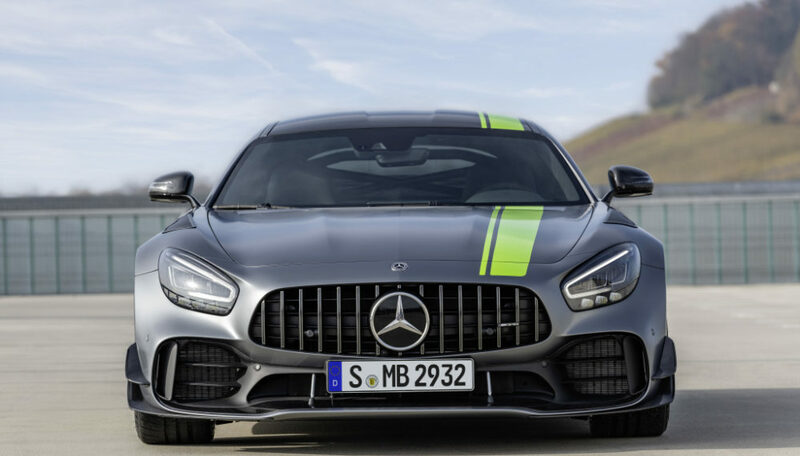 Exterior: Front end with AMG-specific radiator trim featuring vertical struts in high-gloss chrome as well as a front apron with flowing A wing and sizeable air inlets. MULTIBEAM LED headlamps as standard with carbon-fibre elements. Round twin tailpipe trims. Large choice of 19-inch and 20-inch light-alloy wheels as well as 21-inch forged wheels, all of which enable plenty of room for individualisation. Interior: AMG seats in ARTICO man-made leather/black microfibre for driver and front passenger, as well as two individually shaped rear seats. Instrument cluster in 2-tube look with a 320 km/h scale (fully-digital instrument display with 330 km/h scale optionally available) and 17.8 cm multifunction display. Portfolio: Eight-cylinder models with fully-variable all-wheel drive, active aerodynamics, active rear-axle steering, superior driving performance as well as striking exterior and interior details. Engine: 4.0-litre V8 with direct injection and biturbo charging, 430 kW (585 hp) or 470 kW (639 hp) | 800 Nm or 900 Nm. Transmission: AMG SPEEDSHIFT MCT 9G, nine-speed automatic transmission with wet start-off clutch and RACE START function. Data: Fuel consumption, combined 11.3 – 11.1 l/100 km, CO2 emissions, combined 257 – 252 g/km, 0 – 100 km/h in 3.2 – 3.4 seconds, Vmax 310 – 315 km/h. 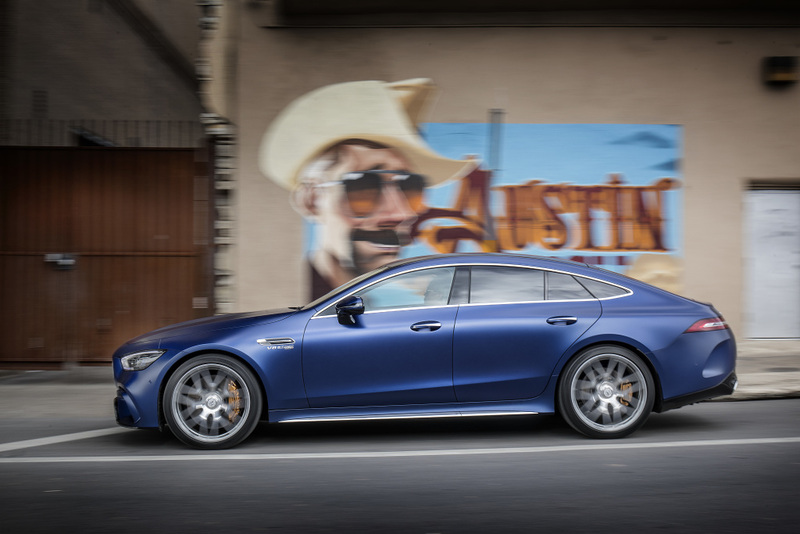 Suspension: AMG RIDE CONTROL+ suspension with multi-chamber air suspension, Adaptive Damping System, active rear-axle steering and electronically controlled rear-axle differential lock. 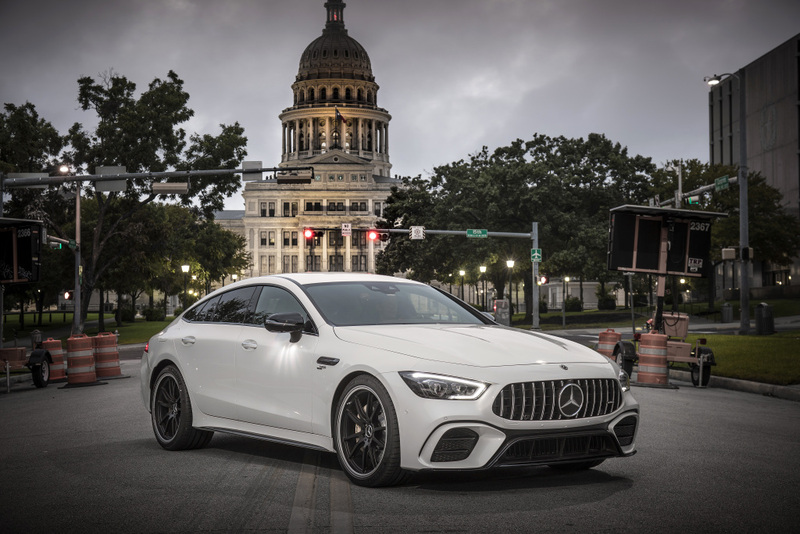 AMG GT 63 S 4MATIC+ comes as standard with dynamic engine mounts and additional “RACE” drive program featuring Drift mode. 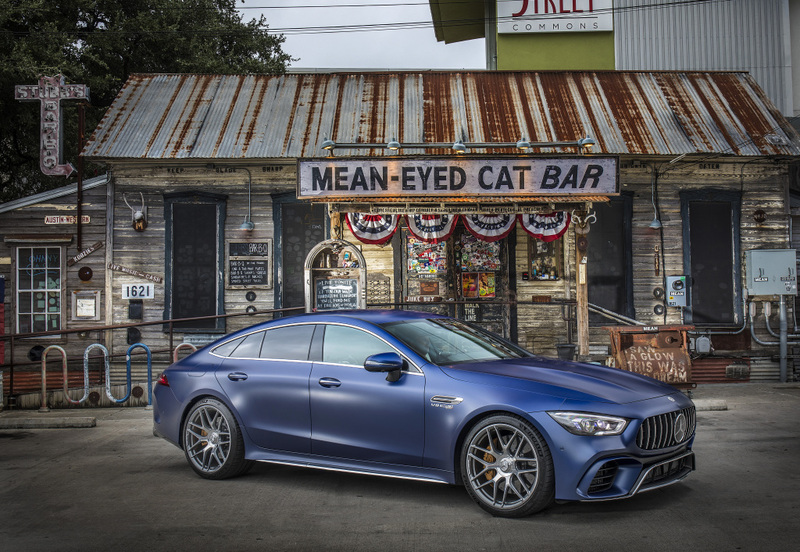 Brakes: AMG high-performance composite brake system with 390 x 36 mm composite brake discs at the front and 360 x 26 mm composite brake discs at the rear. 6-piston fixed calliper (red for AMG GT 63 and yellow for AMG GT 63 S) at the front, single-piston floating calliper (red for AMG GT 63 and yellow for AMG GT 63 S) at the rear. Exterior: Even more sporty appearance thanks to filigree MULTIBEAM LED headlamps, larger exterior air inlets in turbine look, framed by a jet wing in high-gloss black with a trim strip in silver shadow. The diffuser with its large, shaped fins and directly affixed diffuser blade sign off the rear end. Twin trapezoidal tailpipe trims. Interior: AMG seats in black nappa leather for driver and front passenger as well as two individual shaped rear seats. 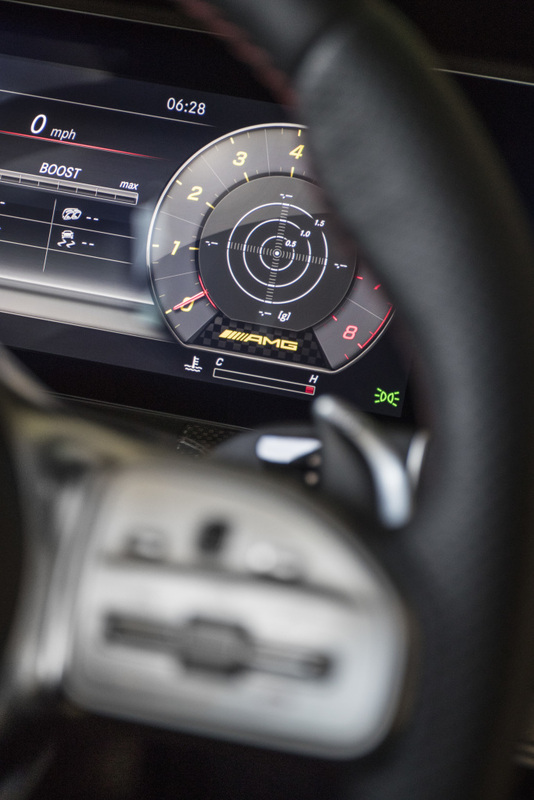 Fully-digital instrument display with 31.2 cm screen diagonal for displaying all important driver information with AMG-specific and individually configurable displays, as standard with 360 km/h speedometer scale.